As everyone knows, the charm of Thailand not only relies on its beautiful scenary but also its distinctive and customized culture and tradition. Especially the unique, symbolic and astonishingly beautiful Thai wedding, it has attracted thousands of travelers come to this beautiful country. Below, let’s get deeper into the details. Generally speaking, Thai wedding covers three steps. Different from most countries where the engagement is started by the groom, the engagement in Thailand is offered by one of the closest friend, on behalf of the groom. This friend goes to the bride’s father and formally asks her hands in marriage. Immediately when the father approves, the details about the dowry will be discussed. Instead of material objects, the dowry in Thailand usually goes to the money or gold which the groom has to pay for his father-in-law, in order to thank him for raisin the bride well. And the amount of money and gold depends on the social status, educational background and personality of the bride, also depends on her virginity. Suppose the bride was ever married and with kids, her family has no right to ask for dowry. Usually, it is the invited astrologer who decides the dating of wedding. The date must be favorable to both parties. In Thailand, August is the best month for marriage. Once the date is fixed, the Buddhist Ceremony organized by 9 monks would be held to show the respect to the ancestors of the couple. 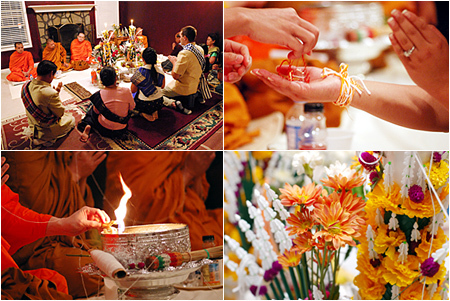 The main ceremony of thai wedding is divided into three parts. Around 6 o’clock in the morning, the wedding starts. 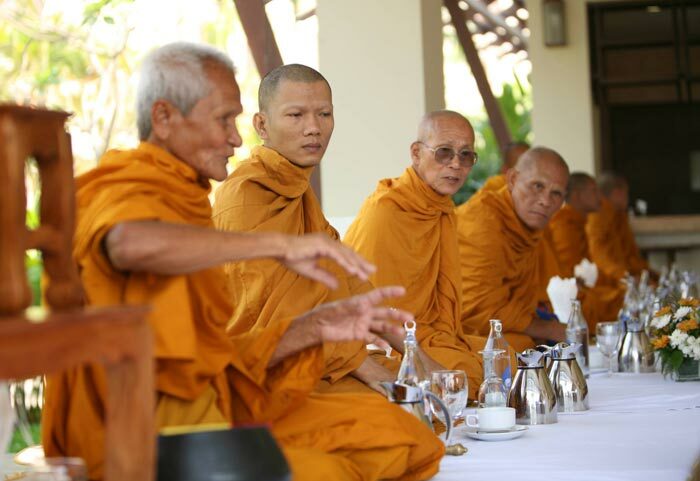 The 9 monks invited on the eve of the wedding are again invited to grace the ceremony. The bride and the groom are bound by a symbolical string during the ritual. When it is almost closed, the couple needs to prepare a light lunch for the monks as well as visitors. Before the leaving of the monks, they also need to donate a cash for the local temple in order to get more blessing in return. The main event of the Thai wedding is held in the afternoon, which is called the Rod Nam Sang. 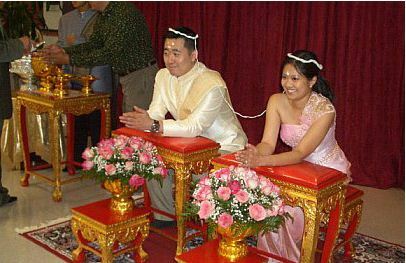 During the ceremony, the bride and the groom have to connect hands via a flower chain because it is a symbol of respect, called “wai”. In this part, the eldest member of the family plays a very important role. He or she needs to deliver wishes of good luck and blessings to the couple. Once this process is finished, the parents, close friends and a certain significant guest soak the hands of the newly-weds in water. The reception part which is the important wedding part in most countries takes place in dinner, in a must-have extravagant manner. 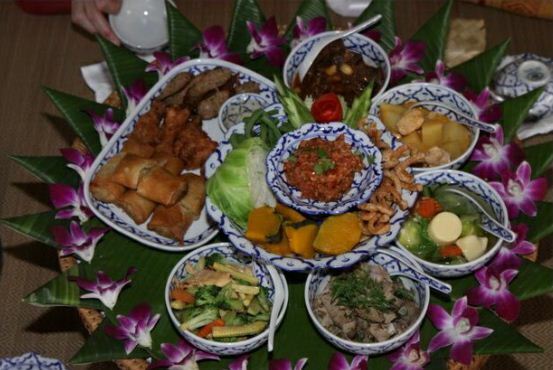 About 100-300 guests would be invited to the banquet and served by whiskey and wine which are the frequent choices of the Thai people, for celebrating together. The whole Thai wedding seems to be very extravagant, especially seen from the perspective of the groom. However, he considers it worthwhile since the wedding symbolizes his new life with the beautiful Thai woman he loves. In Thailand, marriage registration is much more significant than the wedding ceremony. Once this process is not done, the relationship of the couple is not confirmed under Thai laws. Thailand marriage certificate issued by Amphoe confirms the legality of a marriage.